A long time ago I promised I would never write a review for a friend's book. It's dangerous territory - akin to either taking a bribe or being a traitor. But sometimes you have to draw the line and attempt to explain yourself. I've only known Richard Morris for two years so that's hardly time to really call him a friend. Let's just say that Richard and I have a lot of mutual associations that go beyond the Facebook-2010-internet-academic-artsy fartsy-Washingtonian Magazine - variety of what people profess to be relationships in this latest decade. Richard Morris and yours truly are mainly connected through the Memorial Day Writers' Project of Washington, D.C. and for a full explanation of what that Project does you can easily google the name and find out for yourself. So I ran into Richard Morris two years ago when he was performing his music before an audience at the Vietnam Veterans Memorial and I was immediately floored with gut-painful laughter when I heard his songs - war songs set to a bizarre mixture of disco, lounge lizard styling, and schlock broadway musical. It was all very deranged, and very, very funny - because that's what war is. There has always been the tradition of glorifying the inglorious - but it was amplified in western literature after the end of World War I. There's also a human need to report upon the humorous dark side of our nature and that was also a product of post-World War I literature. Some of the most terrifying and some of the funniest things happened to me when I was in Vietnam. Chalk them up to those youthful experiences we all lived through - well, some of us Boomers, any way. I can't speak for the uninitiated. We drew lines in the sand and made our personal choices. I'm living very happily with the choices I made. How about you? Still feeling that pang of guilt? Still asking yourself "What if . .?" You can always sign up for duty in Iraq or Afghanistan and find an answer to those questions that are haunting you. It could be arranged today at your local Recruiting Station. Of course I say this humorously, the kind of humor that I or Richard Morris or countless other Vietnam veterans out there would understand. And now Richard Morris wants to share the joke with his reading audience. What if the idea of war and conflict were turned completely on its head? What if the war in Vietnam was suddenly and completely taken over and controlled by the newest and lowliest lieutenant? This is the situation that the main character of the story Lt. Wilfred Carmenghetti, USA, finds himself in. The answers hold a lot of surprises for the reader. There are all the usual Vietnam War cliches, political statements, and snippets of dialogue you've read in a hundred Vietnam stories or seen on the screen in any good or bad Vietnam War movie. But the difference for this reader was the way in which Morris weaves his material into something fresh, new, and more important, - interesting. The author's writing ability shines when he's describing combat - not an easy thing to do. He's also very good at fabricating a basic story line and set of characters. Sometimes the dialogue falls flat, but this is a minor personal complaint of mine. In the end I found the whole experience enjoyable and well worth the purchase price of the book. I'm in touch with a constant stock of writers, film makers, and documentarians. They all tell me the same thing - their publishers and producers keep telling them 'they don't want, will not accept, or want to have anything to do with the Vietnam War any more.' If it's the truth, it's a sad commentary on our times. Published in 2007, Cologne No. 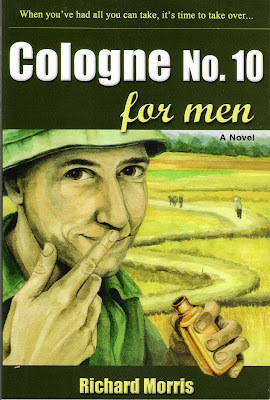 10 for Men is a testament to the fact that there is still a lot of good stuff out there, that we haven't read yet, haven't seen up on the silver screen, or viewed on a DVD.